Add black gram to rice & mix. Add water to the rice mixture and wash well. Add fresh water and soak the ingredients for 8 hours. 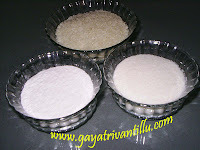 Grind the rice mixture using a mixer grinder or a wet grinder. Here I have used a wet grinder for grinding. Add the soaked ingredients to the wet grinder container and add 50ml water. Start grinding and add 25ml water in intervals. The consistency of the batter should not be thick or thin---so it is advisable to add water in small quantities while grinding to have control. In between push the grains sticking to the sides of the container with a spatula to grind smoothly. 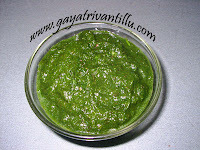 Batter should have a consistency of utappam batter—neither too thick like vada batter nor too thin like a dosa batter. To grind the batter to required consistency 175ml of water was required. Take the prepared batter into a bowl, add salt and mix well. Cover the bowl and keep it aside overnight for fermenting. Place the batter bowl in a plate or a broader vessel. Fermented batter rises and if the container is small the batter spills over the bowl. To collect the spilled batter we need to place the bowl in a plate. When the batter is fermented place this bowl in refrigerator till use. Heat a pan and add black pepper. Then add cumin seeds and fry stirring on low flame. Once fried the cumin seeds swell and release a nice aroma which will fill the space. Then grind the fried ingredients using a mortar & pestle. Take the prepared roasted powder into a plate and cover with another plate to retain the nice aroma till use. To steam the dhoklas use a steamer or a pressure cooker (without weight). Heat the pressure cooker pan and add water to it. Cover the pan with lid and heat on high flame to develop steam. Meanwhile prepare the dhokla stand. 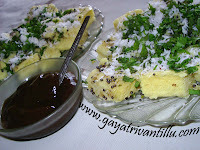 Dhokla stand is readily available in market with 3 or 4 plates. Separate the plates from the stand. Add ghee into each plate and smear to coat the bottom & sides of the plate. Take the batter from refrigerator and mix well. If the batter appears thick add water and mix well to get the desired consistency. Here I have added 25ml water into the batter to get the right consistency. As mentioned earlier batter should not be too thick or too thin---but pouring consistency. Just before steaming dhoklas, add baking soda to oil and mix well. To the baking soda mixture add lemon juice. Immediately after adding lemon juice the mixture appears foamy. Add the foamy mixture to batter and mix well. Now spread the batter evenly in three dhokla plates. Tap the plates to spread the batter to get even and smooth surface. Sprinkle chopped coriander as garnish in one plate. Sprinkle red chili powder as garnish in another plate. Sprinkle the prepared roasted black pepper and cumin seeds powder in the third plate. Arrange the plate in the dhokla stand. When the water is boiling in the pressure cooker pan, lower the heat and insert the prepared dhokla stand. Cover the pan and heat on high flame till steam fully forms in the container. Do not put the weight on the lid as we steam cook the dhoklas. When the pan is full with steam it starts escaping through the nozzle. Then lower the flame and steam cook for 7 minutes. After seven minutes wet fingers to test the dhokla. Open the lid and touch the dhokla with wet fingers. If batter sticks to the finger, it indicates the dhokla is not ready—hence steam for few more minutes. If batter doesn’t stick to wet finger, it indicates dhokla is ready. Switch off the flame and remove the stand from the pressure cooker pan. Remove the plates from the stand and allow them to cool a bit. Smear ghee on the knife before cutting the dhoklas into pieces to get smooth edges. Cut into desired shapes and spread them in a serving plate. As we have garnished the dhoklas before steaming they can be served immediately. To enhance the taste they can be served with coriander chutney too. Heat a pan and add oil. When oil is hot add mustard seeds and fry till they crackle. Then add sesame seeds, chopped green chilies, chopped curry leaves and fry. Add asafoetida and mix well. Spread the seasoning evenly on all dhokla pieces. Serve garnished with chopped coriander. For extra color to the dish sprinkle some grated coconut before garnishing with chopped coriander. Do not add water at once while grinding the batter. Add water in small intervals (25ml) only while grinding the batter. This will help in maintaining the consistency of the batter. If the batter is too thick water may be added and mixed---but if the batter is thin it will not be useful to make dhokla. Place the batter bowl in a plate and ferment. After fermentation, if the batter spills over it will be collected in the plate. Place fermented batter in the refrigerator till use to stop further fermentation. If the batter is over fermented, do not add the baking soda-lemon juice mixture to prepare dhoklas. Roasting black pepper and cumin seeds will bring out the flavor. Lemon solution will make the batter light & dhoklas made with this batter would make them soft & fluffy. Remember to add the lemon solution to the batter JUST BEFORE STEAMING THE DHOKLAS. If the batter is over fermented then adding lemon solution step may be avoided. While inserting the dhokla stand into the hot pressure cooker pan do not forget to take protection against the steam—wear mittens. Steam burns are more dangerous and take longer time to heal. First lower the flame & then insert the stand. If the water is too vigorously boiling inside the pan add a small amount of cold water to bring down the temperature. In short take precautions while inserting the stand into the hot pan to prevent steam burns. Steamed savories are good for health than fried ones. The soft and fluffy textured white dhokla is tasty as it is or can be served with coriander chutney too.